Preparing your space, your instrument, and your mind, are the foundations of great practice session. Is your space comfortable, free of distractions, and have everything you’ll need to stay put and focus? Is your instrument functional, tuned, and properly amplified? Is your mind ready to stay focused? Music making is a creative, intellectual, and physical process. Understanding a hierarchy of goals will let you know which approach to use and when. Here is a visual representation. 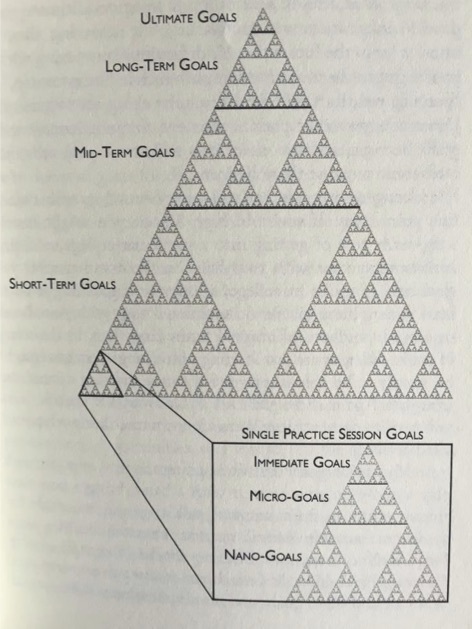 This fractal, representing a hierarchy of goals, was compiled by Jonathan Harnum, author of The Practice of Practice. ● We must focus on an ultimate goal because it is our “north star” in making decisions down the flow of the triangle. ● Notice the Single Practice Session Goals. The immediate goal is the determining factor for the actual tasks we do during practice. Imagine going into a weight room where the different weights have no distinguishable size or labels. You can have the best workout plan in front of you, but it won’t be the best workout if you don’t know how much you are lifting. ● Commit to a time limit for how long you will practice. ● Make a list of the number of tasks you’d like to do. ● Keep the metronome going and record your tempos. ● Perform a specific number of reps with a specific aspect to improve while you do them. Activities with big rewards often take time and perseverance. These tactics will help to make the ride go more smoothly. ● Be patient with yourself. Every day you play you will get better, even if you don’t notice. The biggest difference between beginner and pro is the ability to recognize mistakes. If you are noticing more of your mistakes, your skills are improving. ● Creativity is the secret to keeping things fresh. Make daily improvement a fun and interesting process and you will never have to “practice” a day in your life. ● Get others involved. Play for your family, invite friends over to jam, play at a school or church. What is an artist who never shows anyone his or her work? People appreciate what you do, no matter your skill level. Be bold and share the gift that you have been nurturing!